Review by AllTheBestFights.com: 2018-04-28, fight not so exciting between Anthony Dirrell and Abraham Han: it gets two stars. The former Wbc super-Mw champion Anthony Dirrell entered this fight with a professional record of 31-1-1 (24 KOs=77%) and he is ranked as the No.14 super middleweight in the world. He suffered his only loss when he faced Badou Jack in 2015 (Dirrell vs Jack), after this bout he has won four bouts beating Norbert Nemesapati (Dirrell vs Nemesapati) and Denis Douglin in 2017 (Anthony Dirrell vs Denis Douglin). His opponent, Abraham Han, has an official record of 26-3-1 (16 knockouts) and he entered as the No.57 middleweight. He lost two consecutive fights in 2015, against Sergio Mora (Sergio Mora vs Abraham Han) and Fernando Guerrero, but then he has collected three victories and one draw, with J’Leon Love in his last bout. 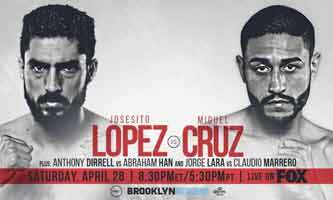 Dirrell vs Han is on the undercard of Josesito Lopez vs Miguel Cruz. Watch the video and rate this fight!